I’m sitting at my dining room table trying to discern the difference in texture, squeakiness, and flavor of the food in my mouth. Across from me, several of my friends are thoughtfully chewing on popcorn and making notes. We all survey the colors and various sizes of kernels in the bowls in front of us while we sip on our wine. Then we determine that we don’t have enough data points and we need to run the blind taste test again with different numerical assignments. This must be done to determine if our judgments are reproducible. We are pretty sure our judgments are subjective and varying- so we probably won’t get a single best popcorn brand. This means that the only consistency we can hope for is that each person’s opinions are reproducible from one taste test to the next. On an evening when there wasn’t much of a plan, we realized that we ha d 5 different kinds of popcorn in the apartment. Some expensive, and some not so. There have been lots of experiments about the quality and flavor of wine. When I ask Google, the first few results are impressive: Forbes, Wired, and BuzzFeed. On the other hand, when I ask Google about taste tests for expensive popcorn I find none that are really about popcorn taste tests. (notable exception seen here.) But who needs Google when you can do the tests yourself? 5 Brands. 2 taste tests. 5 taste testers. The contenders: Ancient Heirloom, Pop-Secret, Jolly Pop: White, Jolly Pop: Yellow, and Jack Rabbit. Listed left to right by price- most expensive on the left to the convenience store brand on the right. Each person gets two votes for each brand (one for each blind taste test we did). Only 3 out of 5 of us picked the same brand as our favorite from one test to the next. Thus, we are only 60% reproducible. Pretty dismal! But our sample size is small. So maybe reproducible isn’t the ideal. Perhaps we are smarter as a group than we are individually? When we compile the votes, something surprising happens. Here’s the big table of ranked votes by brand. As you can see, most brands got lots of different scores. We should take a weighted average of each brand to understand the overall story. We’ll give 5 points to each 1st place vote, 4 points for a 2nd place, 3 for 3rd and so on. Then we divide by 10 to average the weighing. We, as a collective, ranked the popcorn by cost! That’s kind of impressive and surprising. Based on this small study, I boldly propose that popcorn brand preference is more correlated by price than wine is. This is a great feature of popcorn because, unlike wine, the price difference between the cheapest and most expensive is a few bucks! Cheers to that! By the way, did I mention that popcorn is my favorite food? At work last week, I had to describe how popcorn represents my personality: Explosive! Comforting… and Boring? I love popcorn so much that I even make cupcakes that look like popcorn for parties. I made these. Well, not these exactly. 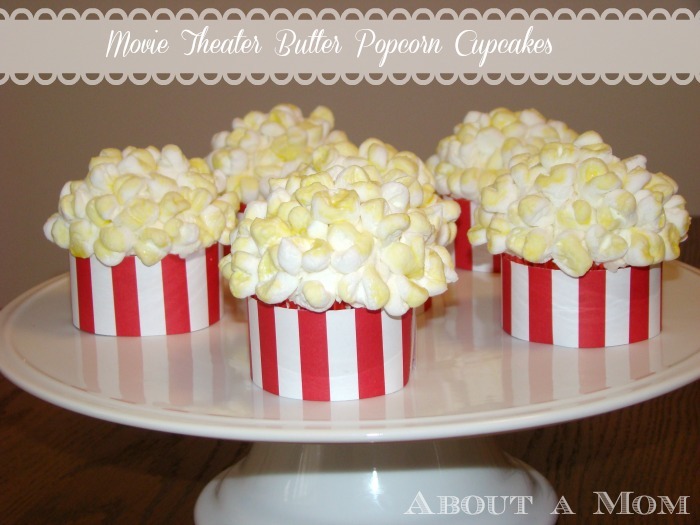 But I used this recipe to make popcorn cupcakes that looked almost exactly like this. It’s an equivalence relation of popcorn! My friends are fabulous. On a similar evening not too long ago, we were making measuring tape circlets as we were trying to determine whose head was larger. Or that other time when we were measuring shoulder width to try to decide how that effects rock climbing techniques… There are so many wonderful things in this world which can be seen more clearly through the lens of mathematics and data. I will happily do analysis on almost anything. And apparently my friends will too! This entry was posted in Communicating Math, Social Mathematicians and tagged popcorn. Bookmark the permalink.